Interested broadcasters and organizations should contact: Mary Fallon by email at maryacfallon@gmail.com or call 408-499-4063. 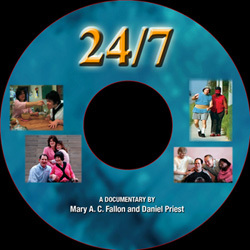 Teaching hospitals, universities, state legislatures, and other organizations may order or rent copies of 24/7 – the battle for at-home care – from Icarus Films, distributor of the Fanlight Productions Collection, by calling 1-800-876-1710 or by ordering from the Fanlight Productions purchase page. The list purchase price of this 33-minute documentary is $259 (DVD) to purchase and $60 to rent for one day. Advocacy groups for people with developmental disabilities may negotiate special pricing. Thanks for your interest in 24/7 – the battle for at-home care.